We have had a day to relax after the Lagunas Route and are ready for some new adventures! 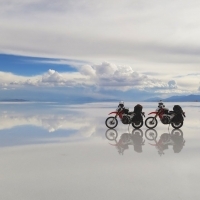 After seeing shots of the Dakar Rally riders racing across the salt flats and the filmclip by motorcycle traveller Sjaak Lucassen, who tries to set a speed record on the Salar on his Yamaha R1, we can’t wait to go to the Salar. Lots of inspiration! However, some preparation is required before we go there. 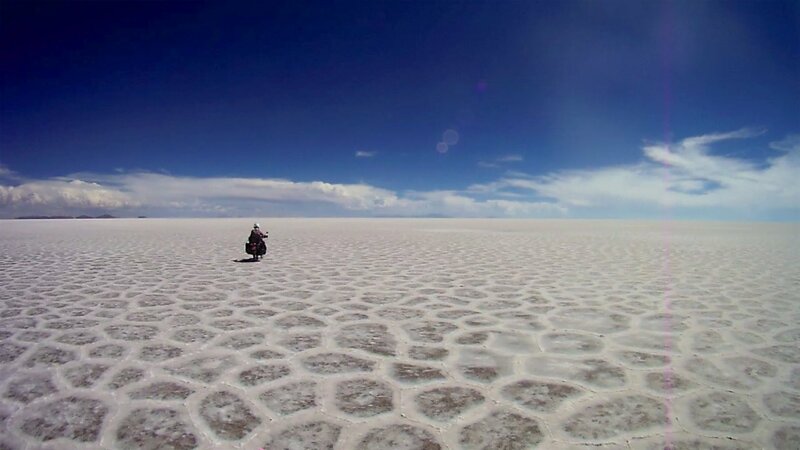 In a way the salt flat can be compared to the Sahara. During the day it is very warm and sunny, while overnight it cools down to below freezing temperatures. It is extremely dry and you cannot find fresh water. And just like in the desert, you can easily get lost because there is no landmarks. It is not a good place to wait for help for a few days. 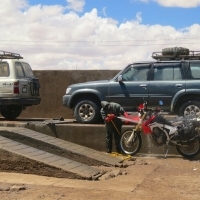 Yet it happens quite often that travellers get stranded on the Salar with engine troubles or get stuck in the mud with their car. Unpleasant situations that can even become life threatening without water. 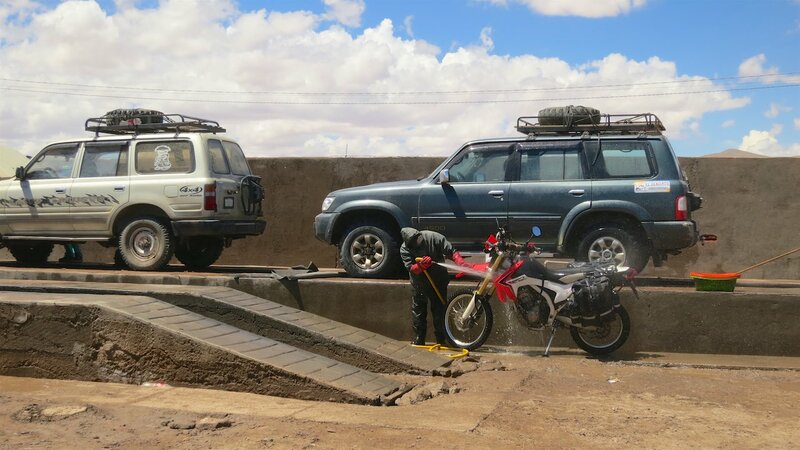 We have the advantage of travelling on two motorcycles, so we can use one bike to get help when needed. With enough water for a few days and the GPS to show us the way, we will be fine. While we are at the hostel gathering some information about the islands, we hear a motorbike stop in the parking. It is a small Honda motorcycle with Chilean plates, ridden by a young guy. We meet Jono from England. 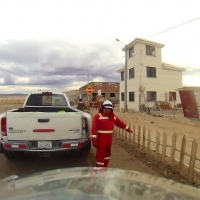 A few months earlier he bought a brand new Honda CGL125 in Chile for only €800. He strapped side bags over the seat, put a topcase on the back and hit the road. 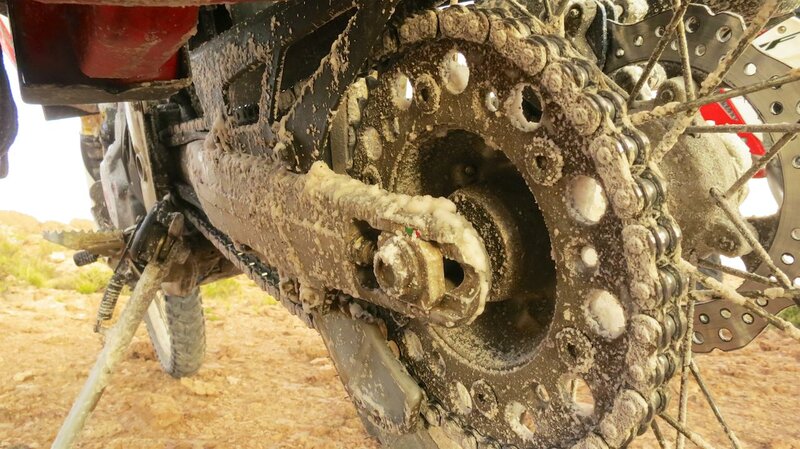 Without custom suspension, without off-road tires and without GPS. The only modifications to his bike were: a turquoise bath mat on his saddle for more comfort, speakers on his handlebars to listen to music and a small jerry can. Brilliant! He is living proof that you do not need a big budget for a great adventure. And as it turns out, he has had quite some adventures. During dinner he tells us about his previous motorcycle travels and the journey through Chile. 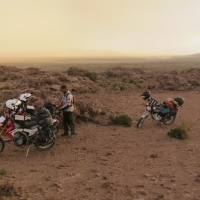 After a great evening we agree to ride together to one of the islands on the Salar to camp there. It is still early when we start riding the next morning. 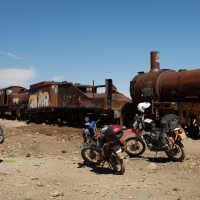 We first visit the ‘Train Graveyard’, the only other tourist attraction of Uyuni. Just outside the center of town there are dozens of antique locomotives. 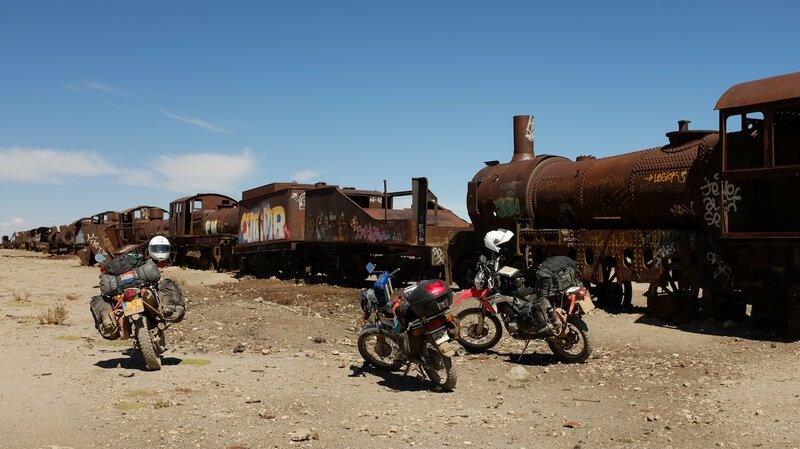 They were once used to transport minerals from the Bolivian mines to the coast. When the mining industry collapsed around the 1940’s, the locomotives were no longer needed. They were parked here, to then never move again. The wagons are now completely rusted and the tracks have disappeared under the sand. It looks a bit eerie and really does look like a cemetery. 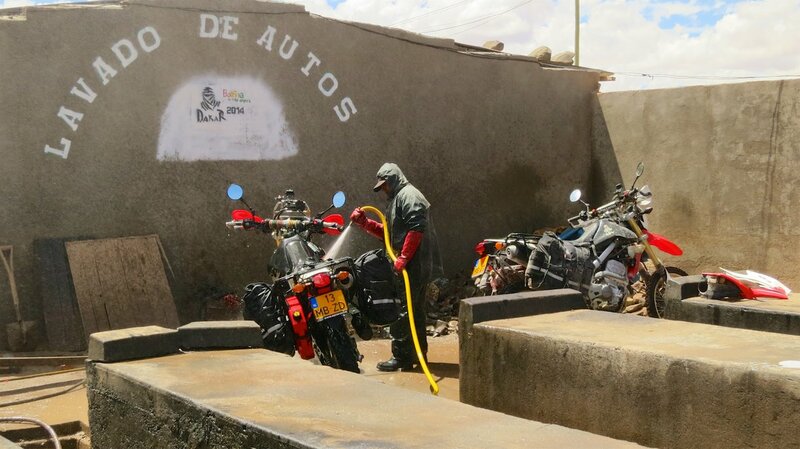 The next stop is the car wash. Not to clean the bikes, but to prepare them for the ride on the Salar. The bikes have to be protected from the salt. Especially the aluminum rims and electricity do not take the salt well. Fortunately the Bolivians have found something for this. They spray their cars and motorbikes with diesel, which forms a protective film. A service offered by the local car wash. It’s not 100% protection, but it’s better than nothing. We explain to the boss of the carwash what we want. He then instructs his men to start working on the bikes. 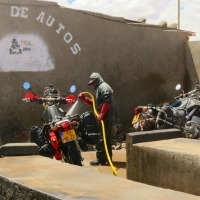 They wash each bike and then use a high-pressure paint sprayer full of diesel to make them dirty again. They do not spray on the seat, the handlebars or the bags, but cover every other part of the bike in a layer of greasy diesel. This morning Peter already sprayed a number of parts with WD40 and put a dab of grease around the valve stems. We hope that is still on there after the thorough wash just now. After nearly two hours our motorbikes are stinking and gleaming with diesel. Time to go! 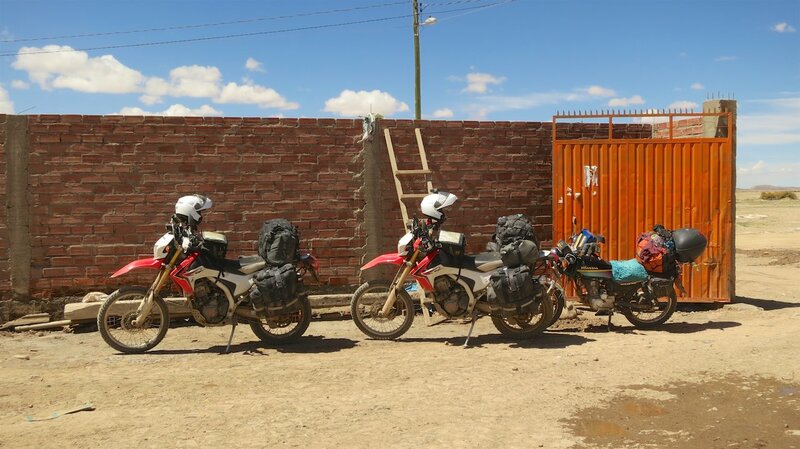 We ride through the main street of Uyuni and immediately find out that our brakes are not working. Despite the request not the spray the brakes, some diesel was spilled on them. Peter had directly cleaned them with gasoline and toilet paper, but apparently that did not make any difference. We try to brake hard a few times hoping the greasy layer wears off, but it does not help. We slide forward without any noticeable difference. When the car in front of us suddenly brakes hard, we only just miss it! Very slowly we ride out of town, happy to discover that after a few kilometers the brakes start working again. Now we still have to find out whether we can actually get onto the Salar. 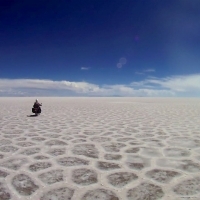 In the rainy season there is often water on the salt flat, which also forms a soft sludge. It is not recommended to ride to the islands then, because you might get stuck in the sludge on your way there. The edges of the Salar are also very soft, with a lot of sludge and mud. 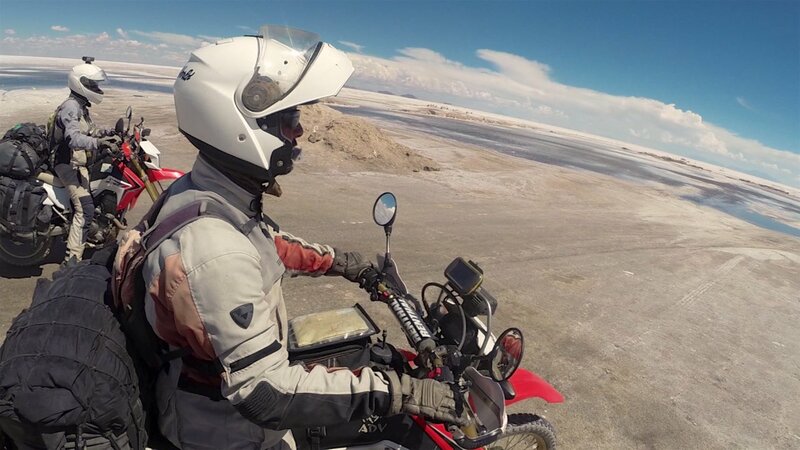 A few kilometers outside Uyuni there is a salt road that takes you past the mud and unto the hard crust of salt. There we can decide whether we continue. According to the latest reports, the route to the islands should be dry. 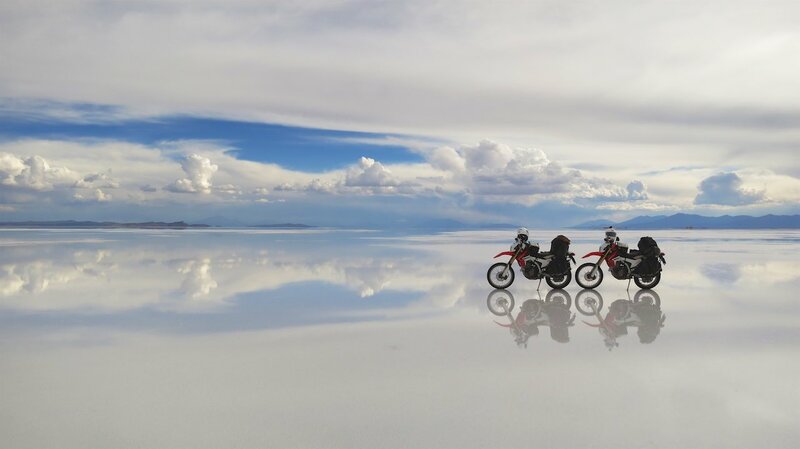 We find the salt road, ride all the way to the end and to our disappointment see large puddles of water. That doesn’t look good. In the distance are some cars, but to get there we first have to ride through the water. 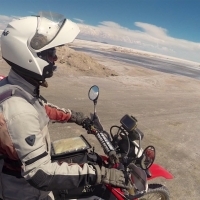 We had discussed that we did not want to ride through the salt water, but it would be such a shame if this would then be the end of our adventure on the Salar. Instead, we decide to have a look. If those cars can get there, so can we on our small bikes. And if we do not ride fast, the water will not splash up against the bikes. Peter goes first, followed immediately by Jono. They make their way through the puddles and ride as slowly as possible through the white sludge. It looks like melting snow and sounds the same. Through the intercom Peter tells me that the puddles are not very deep and the ground is hard enough. With pain in my heart when I think of my poor bike, I follow them. Very slowly, but fast enough to avoid having to put my foot down. I park my bike next to the guys, who are taking pictures of some heaps of salt. I quickly walk around to my bike and see that there is already a lot of salt sticking to the bottom. O no! I have the urge to turn around and ride straight back to the car wash to rinse everything off. At the spot where we parked the ground is gray and there are quite a few puddles. In the distance the salt plain changes colour and seems to be much whiter. Maybe it’s dry there. Most cars have ridden a bit further and we decide to follow their example. If it is dry, we will continue and otherwise we can still turn around. A couple of hundred meters further the puddles have disappeared and we suddenly ride on a hard, dry salt crust. Great! Peter and Jono are clearly also relieved. Peters’ serious expression has even been replaced by a mischievous smile and I know why: the open plain in front of us. 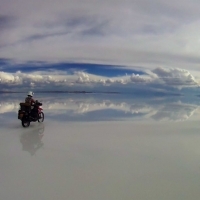 Just like how a beach makes a horse want to run, this salt flat makes us want to open the throttle! 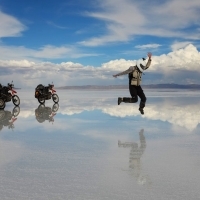 We won’t get to top speeds as Sjaak on his R1, but we can do some serious riding here! Some straight parts, but also swaying from side to side as though we are ice skating. Really nice! It is not only fun to ride, but also very beautiful. Especially the strange structure and particular patterns. 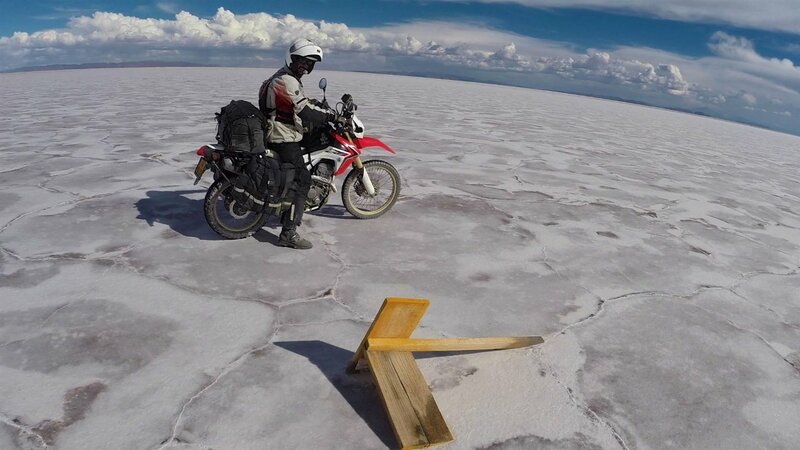 First we ride on a kind of white honeycomb, with patches of salt that are separated by a small crusty line that looks like it has been sprayed on there like cream on a cake. A little further the patches are dark brown, making the pattern reminiscent of the fur of a huge giraffe. And then it changes again. The crusty lines are gone and the ground is now super smooth. We pass several “Ojos”, so called “eyes” of the Salar. Those are small holes in the salt crust with water inside. If you look down the hole you can see that the crust is a few meters thick. At some point we see in the distance that there is something on the ground. It is still far away, maybe a few kilometers, but because everything is so flat, we can already see it. Curious we ride towards it. It is a piece of wood. Perhaps it once was a sign or a flagpole. According to the men, it is a perfect piece of wood for a campfire. They kick it to pieces and each strap some on top of their bikes. A campfire on the island will be nice if it cools down tonight. We shouldn’t take long before we can see the island. Although we didn’t see the cars again that we saw this morning. The last time we saw them they turned right, while the island seemed to be more to the left according to the GPS. 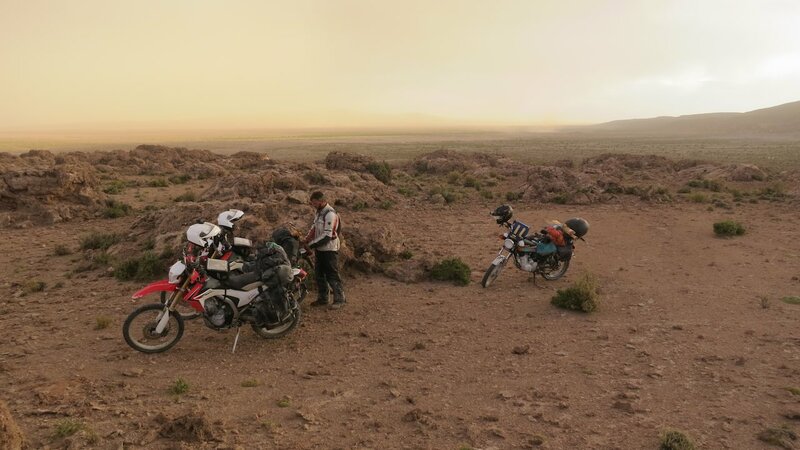 Peter is riding in front with the GPS and suggested this morning to head straight for the waypoint and not chase the cars. In the distance we can now vaguely see the outlines of a mountain, maybe that’s the island. When we continue the Salar changes again. There is now a very thin layer of water on the white salt, which perfectly reflects the blue sky and the clouds. 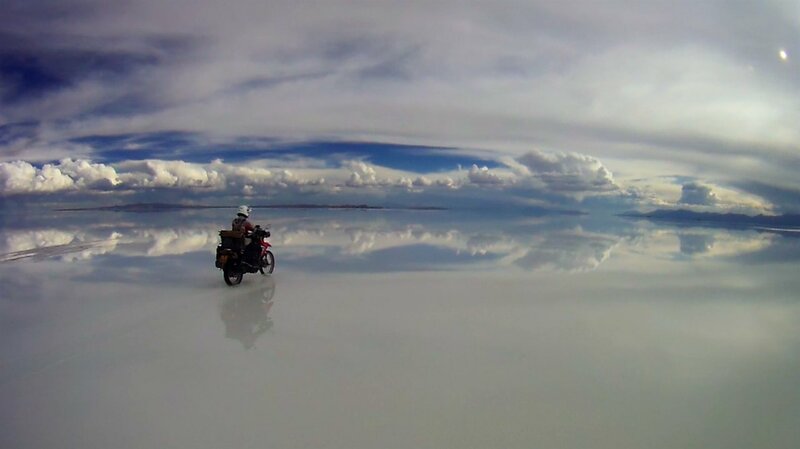 It’s like a big mirror and it seems like we are riding in the clouds. We are speechless. We stop to take pictures and to look around. As we continue it only gets better, it is truly beautiful. We are so busy with the surreal view that we almost forget that we are still riding in the water. At first it was only a thin layer of water, but now there is a few centimeters. I really start to doubt whether we are riding in the right direction. We had heard that the route to the island was dry. If we are indeed almost at the island, we should be seeing cars with tourists. And oddly enough, the GPS is sending us to the southwest while I thought that the island was in the northwest. We stop to discuss the route with Jono. Peter looks at the GPS and is convinced that we are riding in the right direction. It is not far, no more than 15 kilometers. He suggests that, despite the water, we ride all the way towards the waypoint. The alternative is that we turn around and go back 40 kilometers to where the cars turned off. It is already late and the weather is changing as dark clouds float in. We decide to keep riding in the hope that we can soon park the bikes high and dry on the island. The further we ride, the deeper the water gets. First 5 centimeters, then 10 centimeters and after a while even 20 centimeters of salt water. Even though we ride very slowly, we still create a big wave. The pain in my heart is back. This can not be good for my bike. We are only halfway around the world and I still need it for the second half. I hope we will not regret this! Through the intercom I hear Peter counting down the kilometers. When we’re almost at the waypoint, we see something on the horizon. It seems to be a car. When we are a little further, we see two cars and a truck. Is that the island? Then we also see people. But not tourists, as we expected, but workmen in red overalls and a white helmet. That’s strange. 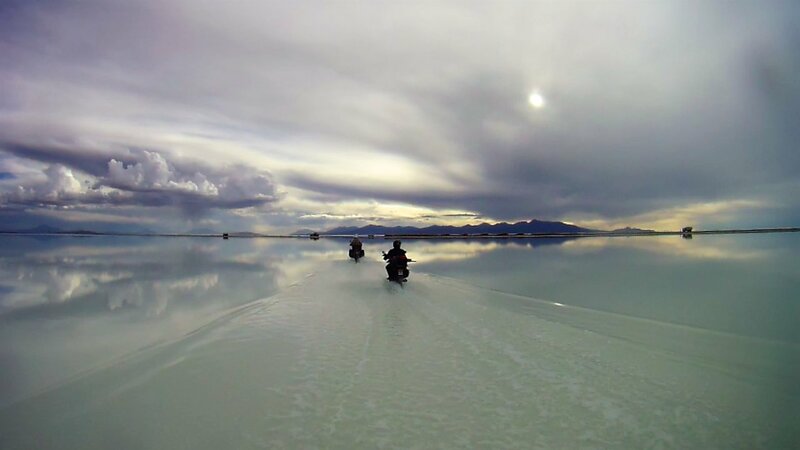 The cars are riding on a road that is built on top of the salt flat. The workers stop with what they were doing and turn around to watch us. We park next to them. “Where do you want to go?” they ask. “Isla Pescado.” They start laughing and point to the right: “Isla Pescado is 80km north of here!” Oh, no! Apparently Peter did not put the right coordinates in the GPS before we left, so we have be riding in the wrong direction all day. The men tell us that it is not possible to ride to the island from here, because there is too much water, more than on the part we just came from. If we want to go the island, we have to ride all the way back to the beginning. It’s too late for that now. The men help to push the bikes on the road. We thank them and start riding towards the main road. But we do not get far, because a white truck blocks the road to make us stop. Two soldiers and three workmen get out of the car and wave us down. Apparently we are on the grounds of a lithium mine owned by the Bolivian State. 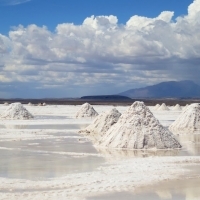 Lithium is extracted from the sludge under the salt crust and is mainly used in batteries. It is a valuable substance. It is very clear that we are not supposed to be here. They start asking a million questions. Only when they have determined that we are tourists and not spies the tone of their questions changes. We take out our map and get directions to get to the main road. However, before we are allowed to leave, we must first go to their boss to show our identification. 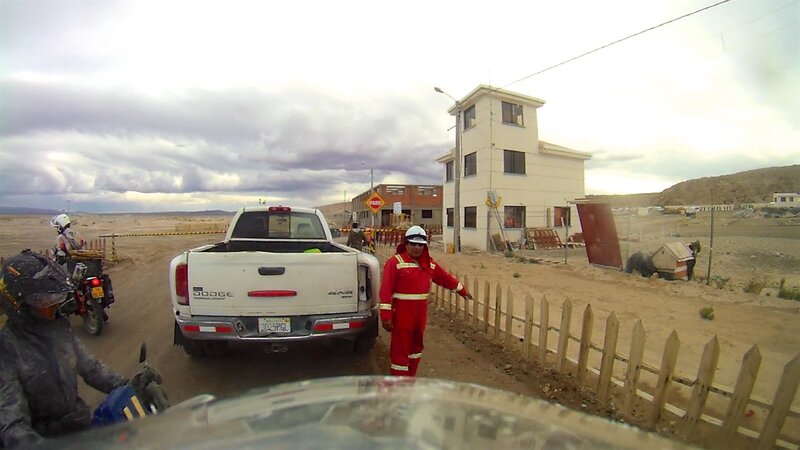 We follow the white truck to the factory and are taken to an office. While we are questioned by the boss, his assistant writes our data in a ledger. Once the paperwork is finished, the attitude of the boss also changes. 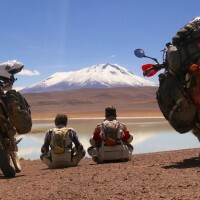 He asks us about our trip and the motors and wants to know what we think of Bolivia. The soldiers take out phones and pose next to the bikes for a picture. 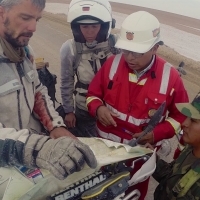 The man explains that the employees of the mine regularly rescue tourists from the Salar. He estimates it happens at least 20 times per year. In some cases the tourists had been waiting for help for several days. He says we are lucky, because if we would have continued, we would have ridden right into the sludge. If we promise that we will ride straight to the main road, we can leave. We drive off the premises and do not stop until we are out of sight. It is unfortunate that our adventure on the Salar ended so abruptly. Also because we would have liked to stay on the island. 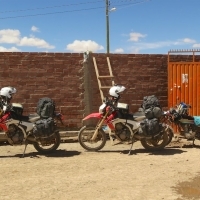 We will not make it back to Uyuni today before dark, so we agree to find a camping spot in the hills nearby. We follow a path and find an open spot next to some large rocks. The guys nod approvingly, mainly because they find it a suitable place for their campfire. 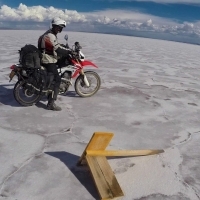 For the first time we take a good look at our motorbikes and see just how much salt is on them. The water has dried up and has left a thick crust of salt. 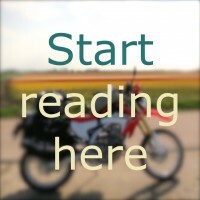 Not only on the bottom of the bike, where you would expect it, but really everywhere. Even the tank bag, the GPS and the waterproof duffel bag are covered with a layer of salt crystals. The chain crisps and the brake does not run freely. I feel another jolt of pain through my heart. 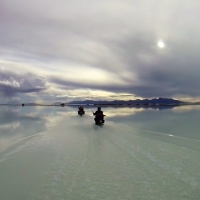 Maybe we should ride in the dark to Uyuni after all, just to be able to rinse that stuff off today. We are covered in salt as well. 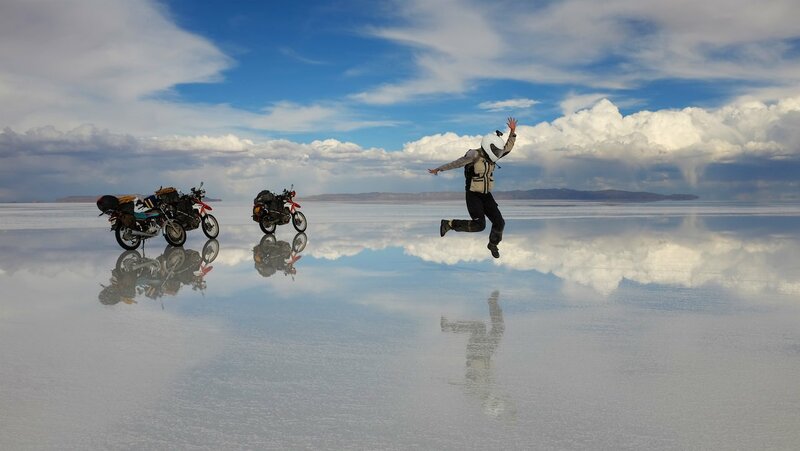 Our motorcycle suits are so stiff that they almost stay upright when we take them off. Jono his black suit is gray and his only pair of shoes is soaked with salt water. He seems to worry more about the speakers on his handlebars though, which have stopped working because of the salt water. We do not have lots of time to dwell on the salty misery, as we are faced with yet another challenge. There’s a storm coming! The sun has disappeared and the air has a strange yellow colour. We forget about the campfire and start pitching the tent as fast as we can. It starts to rain and when the wind picks up we can only just prevent that it flies up in the air. In the pouring rain Peter secures all the lines, while I throw our stuff in the tent. We then crawl into our tent and invite Jono to come sit with us. And then the show really starts. The wind makes the tent poles squeak and the rain almost comes through the roof. During the next hours we are in the worst thunderstorm we have ever experienced. One blast of thunder even harder than the other. 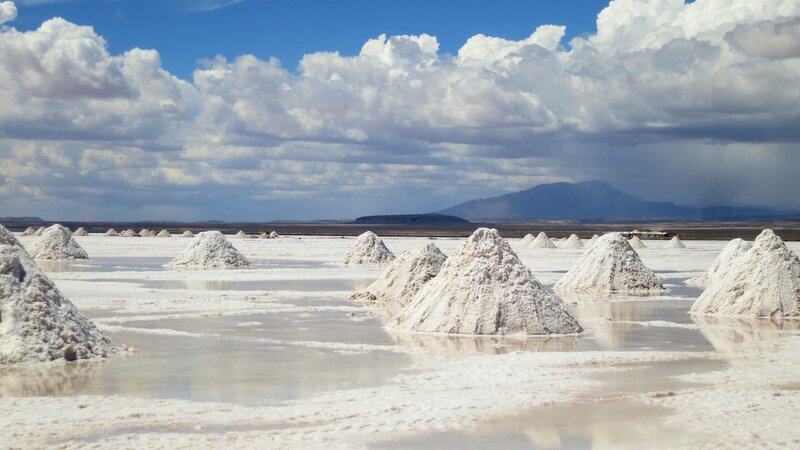 We are now actually happy not to be on the Salar, because the salt is such a good conductor that we would have been right in the middle of the lighting. We toast to a safe return from the Salar with a few shots of whiskey. When the storm slowly moves on, Jono returns to his one man-tent and we fall in a very deep sleep. The next morning we wake up in a different world. It has stopped raining, the wind has died down and the only thing we hear is …. Jerry Lee Lewis. Jono has revived his speakers with fresh water and some WD40. The greatest Rock ‘n Roll-hits come from his handlebars and he is twisting while he packs up his tent. Not a bad way to wake up. 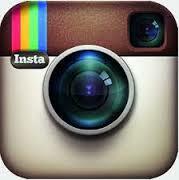 Click here to see our pictures. 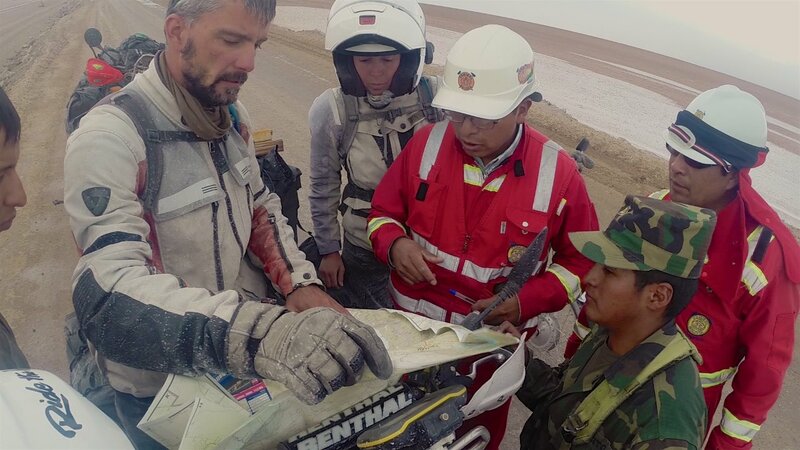 PS: A few months later we found out that the bikes did not come off the Salar completely unscrathed. On both bikes the 12-volt connections above the rear weel were completely corroded. 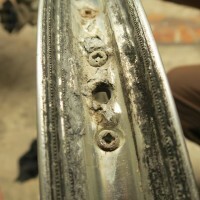 Further, we found out that salt water had gotten into the rims of Peters bike, causing a part of the inner side of the rims to corrode. My bike showed hardly any damage on the rims. 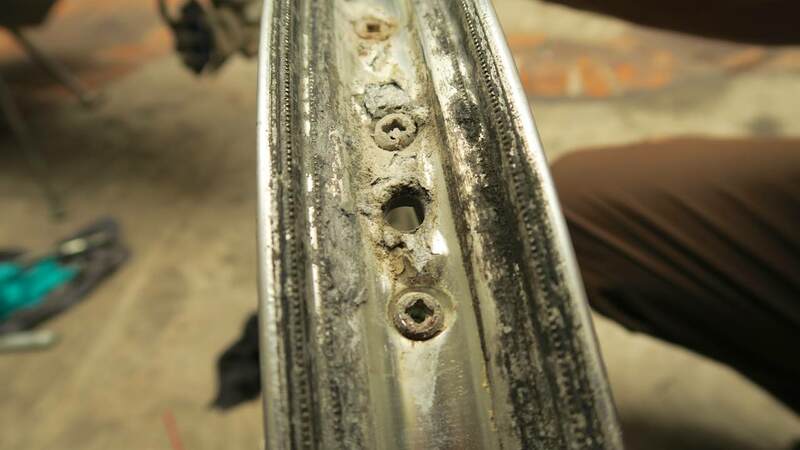 Peter has ground the corrosion away and treated the rim with primer thus preventing further damage. Ik geniet van jullie verhalen. wat een avontuur, onvoorstelbaar dat jullie dit allemaal aandurven. Nog veel plezier en kom heelhuids thuis. Dit bericht van jullie zag ik nu pas. Wat een avontuur weer! Prachtige foto’s en filmpje erbij! Maar dit lijkt mij ook een van de spannendste situaties die ik van jullie heb gelezen. Geweldig wat een avontuur weer! En wat ontzettend mooi wanneer jullie daar rijden op de zoutvlakte en het liedje Paradise op de achtergrond klinkt, Super!!!!! Zoals altijd weer een leuk verslag wat jullie wat jullie maken.